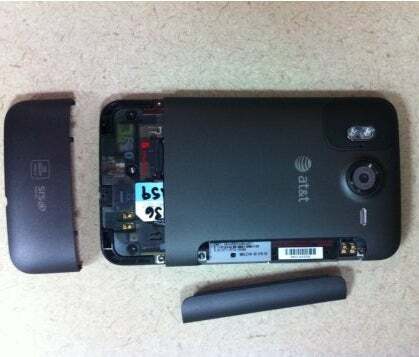 AT&T proved that it is finally getting serious about Android when it announced three hot "4G" (technically HSPA+) phones at CES. One of these, phones, the HTC Inspire 4G, arrived in the PCWorld offices today. AT&T also announced that the Inspire will have the sweet pricetag of $100 (with a two-year contract) and will be available in retail stores February 13. On paper, the Inspire 4G sounds a lot like a GSM version of Sprint's HTC EVO 4G. It sports a 4.3-inch display, runs Android 2.2 with HTC Sense and has an 8-megapixel camera. So, why the $100 gap between the EVO 4G ($200 with a two-year contract) and the Inspire 4G? Well, the Inspire doesn't have a front-facing camera, an HDMI slot or a kickstand. On the other hand, it does have Dolby Mobile HD sound, which is great for watching full-length movies on your phone. battery slots. Rather making the battery cover one removable piece, you have to remove two different panels to get to these slots. The battery slot was especially hard to remove and put back together. I felt like I had to use some force to get the piece to snap in-which is never a good feeling. The Inspire's unibody design is otherwise very attractive and it feels nice and solid in hand. It is slightly thinner than the EVO and a touch lighter as well. The 4.3-inch display looks gorgeous and nicely showcases HTC Sense. We weren't getting a very strong HSPA+ signal over at the PCWorld offices in the South Park neighborhood of San Francisco. Then again, we don't really get a strong 3G signal over here either. Powered by a 1GHz Snapdragon processor, the Inspire is perfectly speedy and handled multiple open apps just fine. I'm still putting the camera, camcorder and other multimedia features to the test so stay tuned for our full rated review.